Composed by Wolfgang Amadeus Mozart (1756-1791). Edited by Franz Giegling. This edition: urtext edition. Paperback. Barenreiter Urtext. Replaces TP 307 - TP 310. Study score. K. 417, 495, 447, 412 + 514 (386b). Baerenreiter Verlag #TP00324. Published by Baerenreiter Verlag (BA.TP00324). ISBN 9790006205271. 22.5 x 16.5 cm inches. Text Language: German/English. Preface: Franz Giegling. All four Mozart horn concertos are closely associated with the horn player Joseph Leutgeb, for whom they were written during the composer's period in Vienna (between 1783 and 1791). They display his compositional approach to the possibilities and limitations of the instrument at that time and were also influenced by Leutgeb's skills as a performer; he was evidently a virtuoso of the hand-stopping technique on the horn. 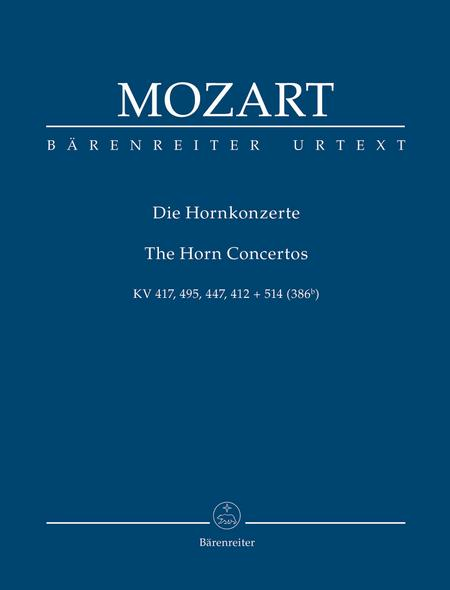 The new Barenreiter Urtext study score replaces the existing individual horn concerto editions (TP 307-310). 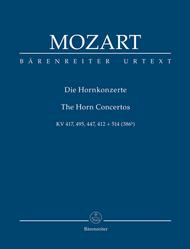 It contains the authoritative musical text of the New Mozart Edition together with Franz Giegling's informative foreword(Ger/Eng) on the history of composition of the works, on their transmission and on the former edition of the works which has been revised for the new edition,based on current scholarly findings. For the first time the study score also includes the Concerto in D major K. 412 + 514 (386b) which is traditionally performed in the version completed by Franz Xaver Sussmayr as well as Mozart's incomplete Rondo movement with the famous derisive allusions to the horn player Joseph Leutgeb.